Poseable Talking Woolly Soft Toy is the perfect companion for all Woolly fans! Press Woolly’s head to hear 8 popular phrases from the show. With bendy legs, you will have hours of fun creating Woollys favourite poses! Woolly is also great for cuddles! This adorable and snugly Woolly plush doll has bendy front and rear legs, so you can put him in poses! He also talks when you squeeze his head – which will be a lot because it is so soft and cuddly! The perfect companion for all Woolly fans! Press Woolly’s head to hear 8 Woolly’s phrases. With bendy legs – have hours of fun creating Woolly’s favourite poses from the show! Made from soft, colourful fabrics, Woolly is also great for cuddles. Size H21, W18, D20cm; Batteries required: 3 x button cell (included). Suitable from birth; EAN: 5013197160407. This toy costs approximately £14.99 (for the latest and best prices make sure you check our retailer list for the Woolly Spider Talking Plush above). 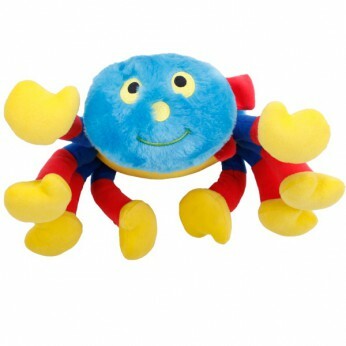 In our review of Woolly Spider Talking Plush we classed it as being suitable for ages 1 to 3 years but recommend you check the manufacturer specific advice before purchasing.